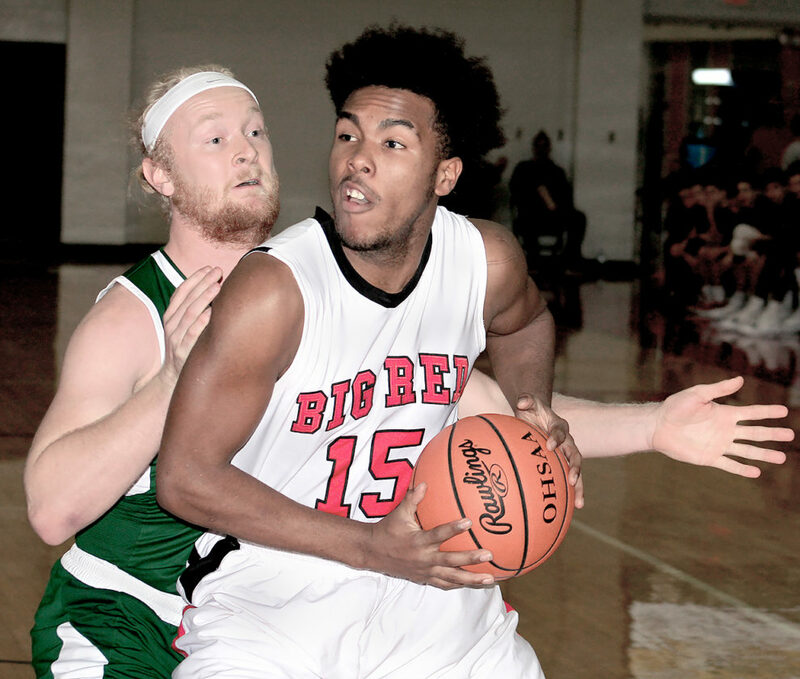 STEUBENVILLE — Big Red started fast and rolled to an 87-49 season-opening victory over Brooke Tuesday inside the Crimson Center. The Bruins hung around early and knotted the score at 7-7 thanks to a Gage Yost hoop off an offensive rebound. From there, it was all Big Red. Josh Zimmerman got the hosts going when he slammed home a pair after recording a steal on the defensive end. Jorian Jones followed a few minutes later with a monstrous dunk off a nifty Zimmerman assist. Nicco Bracone’s triple capped Big Red’s 20-4 scoring run and put Mike Haney’s club up 27-11 after the opening quarter. Steubenville’s lead grew to 30 (50-20) late in the second thanks to a Ryan Rauch bomb from behind the arc. He swished the 3-pointer after taking a pass from Bracone. Big Red was up 54-23 at the break and 79-42 heading into the final period. Because of Big Red’s pressure, the Bruins were guilty of 26 turnovers in the first three quarters. “There are always some positives but, of course, there were many negatives, especially when you lost by that many,” said Mel Coleman, who was making his debut as Brooke’s head coach. “Big Red had 11 layups in the first and second quarters, and we only had three. You’re not going to win many games that way. Big Red had four players in double figures. James Roundtree led the way with 16 points, while Zimmerman and Rauch evenly divided 26. Jordan Wallace contributed 10. Zimmerman also dished out five assists and had numerous steals. All 12 Big Red players cracked the scoring column. Brooke’s Logan Williams took game-scoring honors with 25, despite sitting out much of the second quarter with some early foul trouble. He connected five times from behind the arc. Yost added seven. “He’s our best shooter,” Coleman said of Williams. “He got his points but, at times, didn’t play good enough defense. One guy is not going to win a game for us. We have to get more people shooting, and we have to get more rebounds. Steubenville out-rebounded the Bruins 41-17. Jacob Clevenger hauled down nine for the winners, and Roundtree had eight. 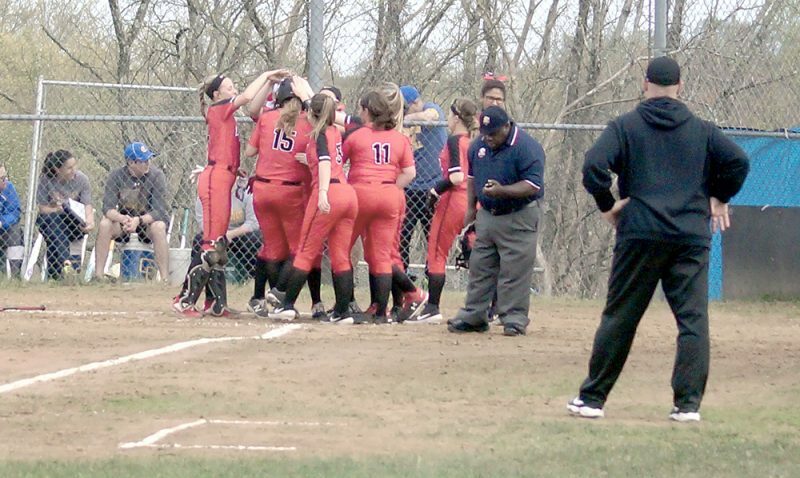 Williams snared four for Brooke, which travels to St. Clairsville Friday. Big Red will visit Catholic Central Friday for Round 1 of the annual city championship series. ¯ Big Red made it a clean sweep by claiming a 71-34 victory in the junior varsity contest. Quinn McCoy led the winners with 21, Chase Zimmerman had 15 and Micah Krause 11. Joey Fuscardo netted 13 for the Bruins. BROOKE (0-1): Brown 0 0-0 0; Pannett 2 0-2 4; Williams 10 0-0 25; Buchmelter 1 0-0 3; Rasz 2 0-0 4; Lilly 0 0-0 0; Silver 2 0-0 4; Yost 3 1-2 7; Coursin 0 0-0 0; Willis 0 2-2 2. TOTALS: 20, 3-4: 49. BIG RED (1-0): Rauch 5 0-0 13; Wallace 4 2-2 10; Biasi 1 0-0 3; Jones 3 1-2 7; Bickerstaff 1 0-0 2; Zimmerman 5 3-5 13; Krause 2 0-0 5; Roundtree 7 2-2 16; Duggan 2 0-0 4; Bracone 2 0-0 6; Jones 3 0-0 6; Clevenger 1 0-2 2. TOTALS: 36, 8-11: 87. 3-POINT GOALS: Brooke 6 (Williams 5, Buchmelter); Big Red 7 (Rauch 3; Bracone 2; Biasi; Krause); REBOUNDS: Brooke 17 (Williams 4); Big Red 41 (Clevenger 9, Roundtree 8); ASSISTS: Brooke 11 (Brown 3); Big Red 15 (Zimmerman 5); TURNOVERS: Brooke 28; Big Red 17.